1. Power on unit by pressing and holding the power button at bottom right of keypad. * If unit will not power on or loses power during use, a charging cradle is included if a recharging of the unit is needed. 3. Press the 1 key to select Scan. 5. Press the 1 key to select Gallery Inv 1. 6. Screen will go blank and show a small black box at the upper left-hand corner. 7. Unit is ready to scan. 8. 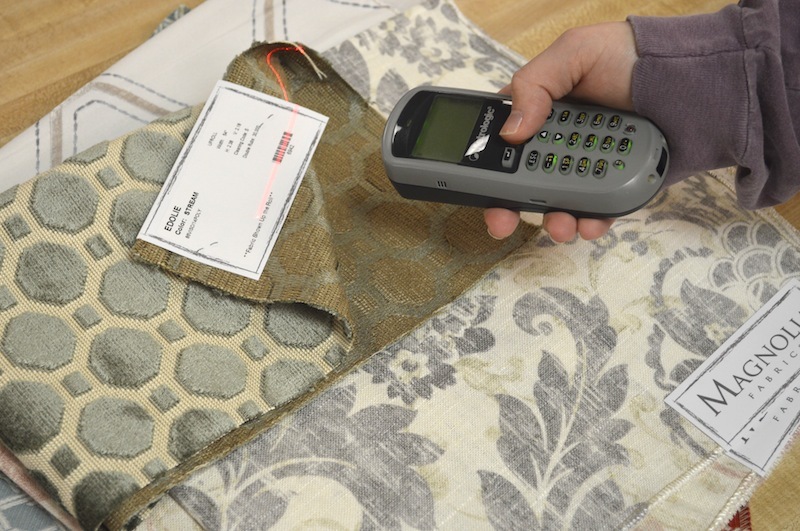 Hold the unit with the infrared projection area facing the fabric sample barcode in which you will be scanning. 9. Press and hold the round orange button to activate the infrared barcode scanner, which will project the infrared reader line from the top of the unit onto the fabric sample’s barcode. 11. If the unit beeps 1 time, projects a green light and returns to a blank screen, the sample is current and should remain in the gallery. 12. If the unit beeps 3 times, projects a red light and displays “data not found…” the sample is discontinued and should be removed from the gallery immediately. Press any key to continue and repeat step 8 and 9. *** IF A BARCODE WILL NOT SCAN FOR ANY REASON, YOU MAY MANUALLY ENTER THE NUMBER LOCATED UNDER THE BARCODE USING THE KEY PAD. AFTER ENTERING THE NUMBER, PRESS ONE OF THE ENTER KEYS LOCATED ON EITHER SIDE OF THE ORANGE SCAN BUTTON. 13. Upon completion of scanning all fabric samples, press the ESC key to return the unit to the main menu. 14. Press and hold the power button until the unit is powered off.